With the fall season coming to an end, and league championships over, it’s all eyes on the state title. The CIAC released the brackets for the majority of the state tournaments, which began Monday. New Britain’s Shawn Robinson and Southington’s Haley Larrabee both played pivotal roles in the success of their teams this past week. The New Britain football team knew it need a win in order to stay alive in the Class LL playoff race and Robinson was certainly up to the challenge against East Hartford Friday night. The senior tailback ran for 271 yards and three touchdowns on 27 carries in the Hurricanes’ 63-26 drubbing of the Hornets, a team many had ranked as a top 10 team in the state. East Hartford was also No. 9 in the Class LL rankings. New Britain was No. 8. Friday night was the fifth 100-yard game of the season for Robinson, who now has 1,013 yards and 12 rushing touchdowns on the year. As a team, the Hurricanes run for 2,555 yards with the senior clearly being a big part of the offense as he was against East Hartford. After the win, New Britain moved up to the seventh spot in the Class LL rankings behind Shelton, Darien, Southington, Newtown, Greenwich and Fairfield Prep. But with two games still remaining on the schedule against Enfield and Berlin, the Hurricanes know they are going to have to come out of those games unbeaten to solidify their first spot in the postseason in four years. Robinson, of course, will be an important part of that. Larrabee has been a key component to the Southington volleyball team’s success this season. The Blue Knights are currently the No. 2 ranked team in the state and are the top seed in the Class LL tournament. Before entering CCC Tournament play, the Blue Knights completed their regular season undefeated at 18-0, something the team hasn’t done since 2004. Over the last week, Southington breezed through the first round of the league tournament with a 3-0 sweep over Hall. But the next day, Southington finally met its match and fell for the first time this year against Farmington, 3-2. The senior outside hitter started the week on a high note, notching eight kills and three aces and 10 digs against the Warriors on Monday. The following night, Tuesday, the Blue Knights were hungry for another win. After winning the first two sets, 25-22 and 25-18, Southington found itself in a back-and-forth battle during the remaining three. All sets were close, but ultimately, it was the ninth-ranked Indians who came out on top. Larrabee recorded three aces, 12 digs and 11 kills Tuesday evening. But the highlight of her night was a great defensive save. “That play she made off of the ceiling, that itself gives your team a lot of momentum and takes a lot of momentum away from the other team,” Heitz said. On the season, Larrabee has notched 205 kills, 64 aces, 211 digs and 12 blocks. And she is hoping to continue that strong play in the state tournament. After its first-round bye, Southington will play the winner of No. 16 South Windsor/No. 17 Staples in the second round on Thursday. 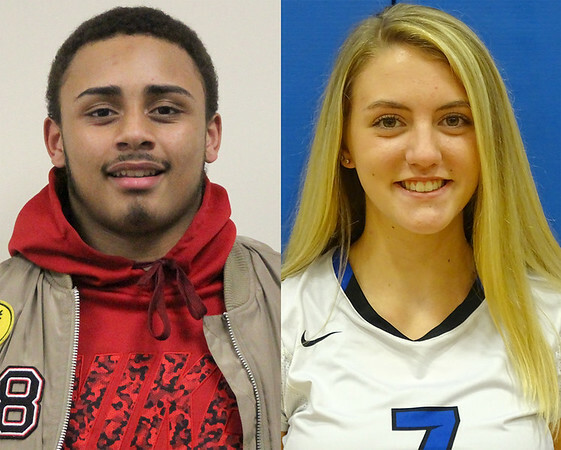 Posted in New Britain Herald, Athletes of the Week, New Britain, Southington on Monday, 5 November 2018 17:50. Updated: Monday, 5 November 2018 17:53.